By Jay Lund and Thomas Harter. California lawmakers recently found extraordinary consensus in approving a $7.5 billion water bond for the November election ballot. If the measure wins, however, future generations will not necessarily reap many of the promised water supply benefits without additional actions. To significantly improve its resilience to drought, California must quickly get a grip on the runaway depletion of its dwindling groundwater resources. In this year’s drought alone, California farms and cities are expected to pump more than 20 million acre-feet from aquifers. That is more than all the surface water diverted from the state’s rivers and streams. And it is far more water than could physically be delivered from all the additional reservoir capacity proposed for bond funding. Groundwater is and always will be California’s primary buffer against droughts. Yet many parts of the state have been drawing on aquifers as if they were bottomless savings accounts. The pump-as-you-please practice threatens the sustainability of the state’s most profitable agriculture, particularly permanent crops such as vineyards and orchards. Continued overdraft furthers land subsidence and seawater intrusion, worsens water quality and diminishes fish and wildlife habitat dependent on groundwater. As water tables drop, the annual costs of pumping and drilling more and deeper wells quickly exceed those of financing the proposed water bond – about $500 million in state general funds a year, for 30 years. Agriculture and rural residents will initially bear the brunt of increased pumping costs and diminished reliability of groundwater during droughts. In the longer term, pumping as usual means groundwater simply will not be an available alternative to many Californians who lose access to surface water during droughts. The current drought poses a historical opportunity to bridge a major gap in California water regulation that other western states remedied almost a century ago. While the water bond contains many useful elements, the Legislature has before it much more important legislation for ensuring California’s resilience in droughts. 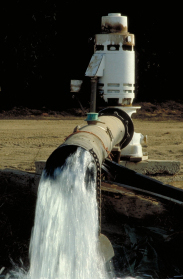 Two proposals, Senate Bill 1168 carried by Sen. Fran Pavley, D-Agoura Hills (Los Angeles County), and Assembly Bill 1739authored by Assemblyman Roger Dickinson, D-Sacramento, would require local agencies to manage groundwater sustainably. Sustaining a prosperous civilization in California’s dry climate requires firm accounting of all major water resources, including groundwater. When management of a resource as valuable as groundwater is lacking, overdraft and litigation fill the void. Investments that depend on groundwater then become riskier, leading water users to pursue more secure, but more expensive and environmentally damaging water supply sources such as deeper wells and new reservoirs. The added risk of unreliable groundwater also can increase the cost of credit for agriculture and rural development. Increasing the security and enforceability of groundwater and surface-water rights is the most effective action the Legislature can take to help this dry state weather droughts and reduce water costs to cities and farms. Jay Lund, a professor of civil and environmental engineering, and Thomas Harter, a groundwater specialist, are with the Center for Watershed Sciences at UC Davis.